The Howard Miller 630-152 Hillsborough Mantel Clock is highlighted with bookmatched oak molding that frames the dial and offers scrolls on the sides. The ivory dial offers Arabic numerals. A beaded molding accents the front and sides. Finished in Dark Oak Yorkshire on select hardwoods and veneers. 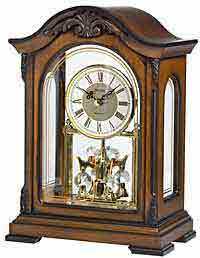 Quartz, dual chime movement plays Westminster or Ave Maria chimes, and features a volume control, hourly only or hour and quarter hour chimes. Automatic nighttime chime shut-off between 10:00 pm and 7:15 am. and automatic nighttime chime shut-off option. Two "C" batteries are required which will power the clock well over a year at a time. 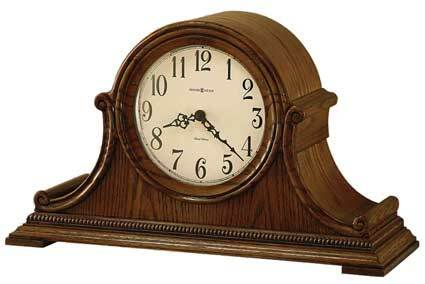 Clocks for sale at The Clock Depot including the 630-152 at discount prices.